When it comes to My Favorite Things, there's a lot to love, wouldn't you agree? 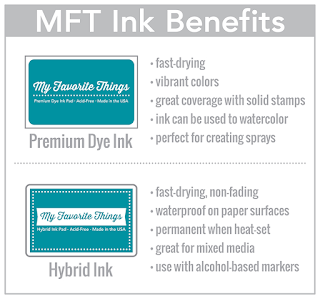 Let's celebrate all the awesome things that make MFT so great - from A to Z! If you want to spell just about anything, our alphabet Die-namics are perfect in every way! We've got two blogs to keep you inspired and informed. Besides this one, you can visit the MFT Blog. We also love our innovative Blueprints Die-namics, touted as The Foundation for Your Creativity. You can use our Blueprints Sketches HERE, or mix and match the pieces to create something uniquely you! 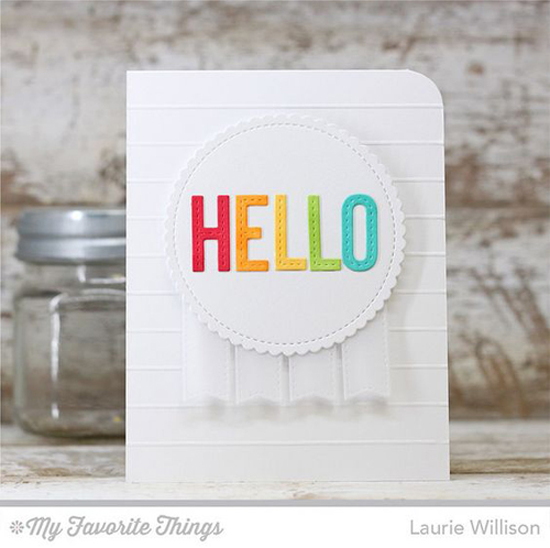 The letter C brings you many wonderful things from My Favorite Things — from a delicious array of colorful card stock to sketch and color challenges and some of the greatest customer service out there! A fantastic Design Team helps us to showcase our amazing products, and our vast catalogue of Die-namics (our EXCLUSIVE, American made line of steel dies) gives you unlimited options and hours of creativity! Scroll through our Educational Resources, and you never know what you'll learn! From links to theme weeks to Tips & Tricks to FREE classes for each release, we'll help you hone your craft and learn new techniques and crafting tips! Having a serious aha moment is just a few clicks away! In this day and age, a presence on Facebook is a must, and our Facebook page is awash with inspiration, information, sales, and links to fuel your creativity. Be sure to give us a "like" so that you don't miss one single minute! We also host two Facebook groups — one for general MFT chatter and another dedicated to our challenges. Join us for all of the fun and friendship that you can find! You can also find us on Flickr HERE. It's always a privilege to get our product in the hands of talented guest designers, and their creativity inspires us immensely! Scroll through innovative and spectacular projects created by friends of the MFT Family! You can find guests on this blog HERE and on the MFT Challenge & Inspiration Blog HERE. And what would we be without our super fun gift cards? We give them away as prizes sometimes, but they also make great gifts for all of your crafty friends! Our Hybrid Inks are superb, and we're pretty proud of our Premium Dye Inks, too. Check out the graphic above to see what makes each of them great and to learn how they differ. If eye candy is what you're looking for, hop on Instagram and follow us HERE. We post fresh content, videos, and exciting updates daily. You can also get lost in projects featuring MFT created by designers around the world by following #mftstamps. The absolute joy of new products arriving on your doorstep. The joy of creating. The joy of making people smile with your handmade cards. And the joy of the friendships made because of our wonderful hobby. Pure, unadulterated JOY! Our founder, Kim van der Sanden opened My Favorite Things in 2006, initially offering existing paper-crafting products that were her favorites, the impetus behind the company’s name — My Favorite Things. She then decided to produce proprietary products and debuted her initial line-up of stamps in 2008. 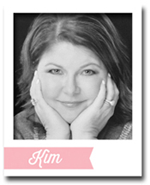 Kim's continued emphasis on offering the highest quality products, delivering excellent customer service, and helping paper crafters everywhere bring their creativity to life has resulted in My Favorite Things becoming a well-respected industry favorite. In an effort to help you get organized, we provide downloadable Label Templates for each release with the names of all of our stamp sets, stencils, and Die-namics. The .doc files are compatible with 8195 Avery Return Labels, 8167 Avery Return Labels, and all comparable sizes. Getting organized was never easier! With our monthly releases and now our mid-month card kit releases, you never have to wait too long to discover something new from My Favorite Things! Our newsletter is a source of My Favorite Things news and inspiration delivered right to your inbox! You can sign up HERE. Even if you're already receiving our newsletters, be sure to update your preferences to get exactly what you want. You've got all sorts of our fun products, but how do you keep it all organized? Check out our Organizational Solutions for myriad ways to tame everything in your stash from card stock to stamps to stencils to inks! Keeping things organized gives you more time to create! The letter P is a big one, for sure. From live broadcasts on our Periscope channel allowing you to see our products first hand and to ask questions in real time, to our Pinterest profile with over 15,500 projects, sketches, and videos neatly categorized by type, we're helping you get creative all over the world wide web! And we LOVE giving out prizes, too. Follow us on all of our social media channels and sign-up for our newsletter so you can get in on the fun! We pride ourselves on providing our customers with the highest quality products. Our clear stamps, Die-namics, and stencils are made in the USA, and we take great care that everything is top-notch in every way. Our Printable Resources provide you with lots of handy information — from sketches to color charts to Cutting & Embossing Guides and Color Reference Guides for our patterned paper packs. We do our best to take the guesswork out of your creative time! You never know what sort of gem you'll find when perusing our resources. Our fantastic stamps have been a part of our history from the very beginning. We've created an extensive library of both clear stamps and rubber background stamps for unlimited inky fun! From Birdie Brown to Laina Lamb Design to Lisa Johnson Designs to Miss Tiina to Pure Innocence — whatever your style, we have something for you! And don't forget our super cool collection of stencils! They will work on a variety of surfaces including card stock, canvas, cork, chipboard, acetate, and fabric, and they allow you to paint, spray, mist, spritz, airbrush, sponge, doodle, mask, and more! The fast paced world of Twitter keeps us informed in 140 characters or less. You can find us there every day of the week! Follow us on Twitter HERE to always be in the know. We wouldn't be where we are today without all of you — our faithful followers, our coolest customers, and our biggest fans. Thank YOU for all that you do to make us great! We love our community of MFT friends! Not only are our products of the highest quality, we offer great value, too. Our carefully created monthly card kits provide a savings of 25-30% on exclusive, custom-curated products with you, the crafter in mind. Our Free with $60 Die-namics is available with each qualifying order over $60 (after any discounts, before shipping and tax). USA customers receive FREE shipping on each order over $75 (you will see a $6.50 credit automatically applied to your shopping cart). International customers will receive a $6.50 shipping credit on all orders over $75, automatically applied to your shopping cart. Our Shop to Save discounts start at 10% for each order over $100 and go up, up, up to a savings of 20% on orders over $500. A shout out to our phenomenal warehouse staff! They take pride in packaging your box full of happiness with the utmost care with pretty pink tissue paper and a delicious mint! And then they let you know that your package is on its way with timely emails and tracking numbers. When you see Out for Delivery, it's a reason to celebrate! If you love learning, our YouTube channel MFTv will get you inspired and creating! Beginners can learn firsthand simple Tips & Tricks, and even the most advanced crafter can learn cool techniques in our weekly MFTv videos. If you're interested in how a certain product works, we share informative videos showcasing every product in each release. Take some time to explore, and don't forget to subscribe to our channel. You won't regret it! And finally, we have a ZOO full of creatures for you to create with! Our adorable menagerie includes just about any animal imaginable from Adorable Elephants to Forest Friends to Flamingos and Magical Unicorns. There are llamas and monkeys and pigs and hedgehogs, too! There's so much to love about My Favorite Things, and we're glad to share it with you! You guys do such an awesome job! Thank you for all of the fun products and inspiration! Keep up the great work!